Sometimes the simplest things still need a little nuance. They seem as plain as day -- one glance, one sip, one savor -- easy to decipher. We don't take note. So often, it's the more intricate flavors and recipes that we feel we must pay heed to ... jotting down notes from a favorite meal hoping to jog our memory and taste buds when we return to our own kitchens. But a simple salad? A mere handful of ingredients. This seems like a simple task. And that's when you get nudged by the beauty of nuance. 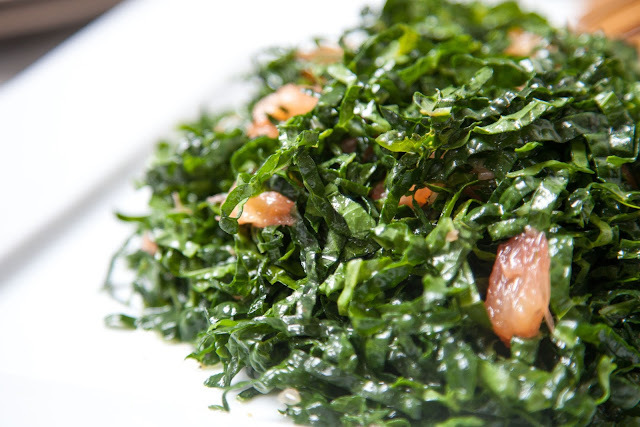 This little kale salad is my version of one that we get every time we visit Oven & Shaker. While this self-proclaimed "urban saloon" is the brainchild of Cathy Whims, a James Beard nominated chef, and is touted for its authentic Italian street food fare and, most notably, for its pizza oven (the "Oven") and their mixology offerings (the "Shaker"), this kale salad is the first thing we think about when we think Oven & Shaker. 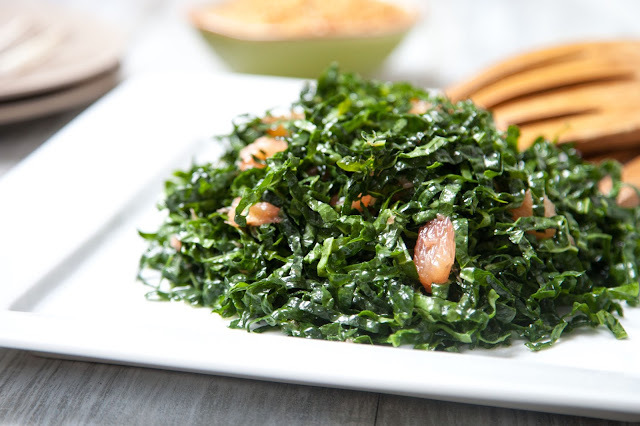 A simple kale salad with little pops of fresh grapefruit and a light anchovy vinaigrette. It's so simple, I didn't ask any questions of our server the first time we tasted it, didn't jot any notes down. It's just kale, grapefruit and a vinaigrette. The first time I made it, I was far too generous and heavy-handed with my anchovies. And, garlic. Did I even taste garlic in the O&S salad? And, grapefruit. Was the fresh citrus that prominent? I didn't recognize exactly how I had erred. It was edible, but not right. Thinking a lighter touch on the vinaigrette would render the salad I was after, I pulled back on the anchovies, cut back on the garlic... oh, and fresh lemon. Lemon? Was there lemon? We visited Oven & Shaker last weekend. When our salads arrived, I took note. First of all, the kale was delicately cut into thin ribbons (a chiffonade cut, not a chop); there was a light touch of grapefruit, offering a cool, fresh citrus pop without overpowering the delicate nature of the greens. There was a subtle little dusting of toasted bread crumbs sprinkled on top. And, a delicate, little lacey cheese fricco served alongside that could be chipped to incorporate with the salad or simply eaten like a chip. I then looked at the menu again... anchovy-vinaigrette was the dressing, pecorino the cheese, and the fricco was a poppyseed fricco. Two days later I set out to again make my little version of the favored salad... first slicing the kale leaves into thin little ribbons. 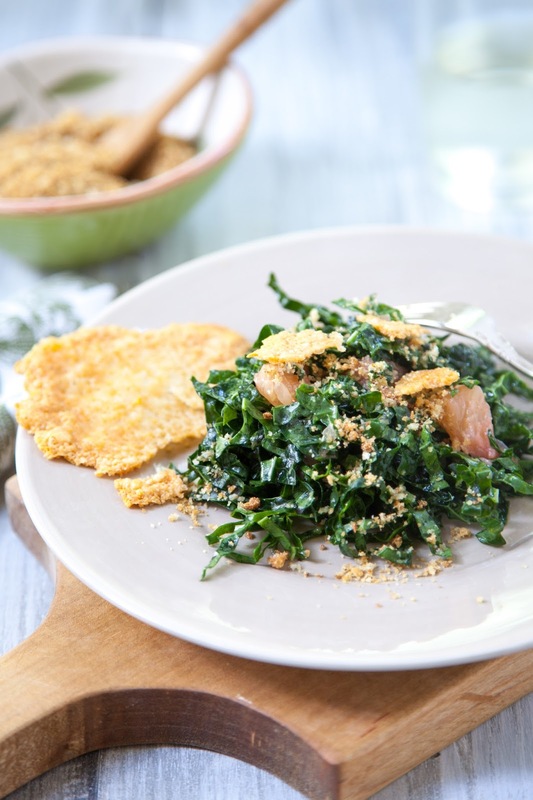 This is an essential, yet seemingly simple element to this salad that should not be overlooked as it results in a very light, almost fluffy quality that helps to tame kale's more robust nature. The grapefruit should be cut into supremes and then into bite-size pieces. I found one large grapefruit was plenty for two generous salads. The breadcrumbs? Well, I was going for a quick version so I grabbed a bag of crisp crostini that is baked and packaged by Whole Foods. A few spins in the food processor results in a good toasted bread crumb in seconds. Though I am staying away from dairy, I made a few parmesan friccos to serve alongside (or overtop, as preferred) by simply sprinkling some shredded parmesan in little three-inch round circles (barely more than one layer thick, if that) on a sheet pan and popping it under the broiler for maybe a minute... keeping a hawk eye on it so that they didn't burn. What I took particular note of in again tasting the restaurant version of this salad was the lightness of the vinaigrette... there was no extreme flavor notes. The anchovy was definitely a flavor enhancer and not one you'd easily recognize except for the menu call out. Maybe they didn't use whole, canned anchovies (as I had been doing... bringing the vinaigrette together with the help of a blender). Perhaps all it needed was a little squeeze of anchovy paste and a good little whisk. And there was truly no real garlic or lemon kick. So... subtle was the key. While cutting my grapefruit into supremes, I collected its juice in a bowl placed beneath my working hands. I do this any time I segment or supreme citrus even if it's not going into a recipe... I'll just drink it up. As it collected the juice in this dish, I had a little epiphany... did that vinaigrette use fresh grapefruit juice? That would make so much sense... a little citrusy, a little sweet... a perfect little tang? And with that thought, I had my vinaigrette... simply fresh grapefruit juice whisked with a little extra virgin olive oil and a light touch of anchovy paste, seasoned with a dash of kosher salt and ground black pepper. Little nuances made to a favored salad... as plain as day (if day were plain). Place ribboned kale in a large bowl. Add pieces of grapefruit. Set aside. In a small bowl, whisk fresh grapefruit juice, olive oil and anchovy paste until smooth and fully incorporated. Season with salt and pepper, to taste. Lightly dress kale greens and toss gently to combine. Plate salad and serve with toasted bread crumbs to top. If making cheese friccos: I used about 1 tablespoon of shredded parmesan per fricco, spread thinly in a circle on a baking sheet, then popped until broiler with a watchful eye. Once the cheese has melted into a little golden disk, removed from oven and allow to cool. Serve alongside salad.